A differential staining techninque is one that employs 2 different stains. For example, the gram stain is considered a differential stain, because it uses more than one stain; a primary stain, and a counterstain.. The primary stain in Gram stain is crystal violet, and the counterstain is safranin. Gram stain is used to distinguish between bacteria that are gram-positive and gram-negative, due to the different cell wall structures and compositions. Gram positive and Gram negative cells are differentiated with the Gram stain based on the composition and structure of their cell wall. Cell wall features in a Gram positive cell is 90% peptidoglycan plus 10% teichoic acids. 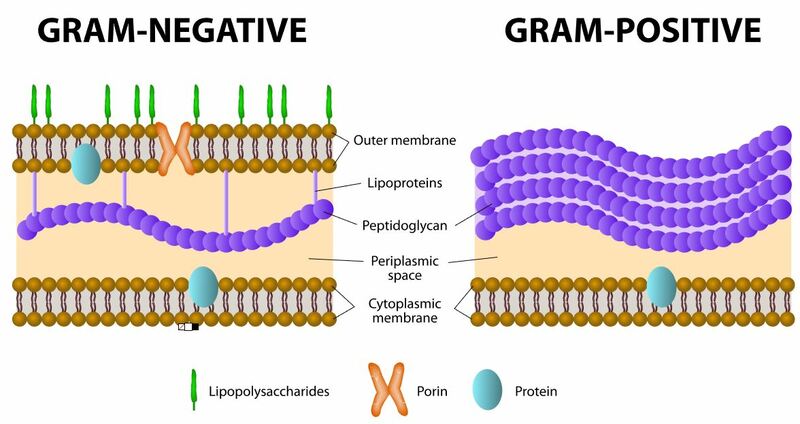 Cell wall features in a Gram negative cell is 10% peptidoglycan plus 90% outer membrane. Why is staining peptidoglycan a big deal? Unlike bacteria, archaea cell walls do not contain peptidoglycan. Unlike bacteria,archaea cell walls do not contain peptidoglycan. Many types of eukaryotic cells also have cell walls, but none made of peptidoglycan. to help the cells adhere to the slide so that they won't wash off during the staining procedure. STEP TWO = PRIMARY STAIN STEP. In this step, the primary stain, Crystal Violet, is applied to the cells. Crystal Violet is a dye that colorizes peptidoglycan, which is a component of the cell wall in bacteria cells. STEP THREE = MORDANT STEP. A "mordant" is a substance used in staining or dying procedures that "sets" or "binds" the stain to the structure being stained. When a mordant is used, the stain is more resistant to being washed off. In the Gram stain, Iodine is used as the mordant to help Crystal Violet bind more strongly to peptidoglycan. STEP FOUR = THE DECOLORIZATION STEP. In the Gram stain, Alcohol is used to "decolorize" the cells. In this step some of the Crystal Violet is removed from the peptidoglycan layer. This step is 20 seconds long and it is the most important step in the Gram stain procedure. It is critical to leave the slides exposed to the decolorizer (alcohol) long enough to remove the crystal violet stain from the thin peptidoglycan layer of the gram-negative bacteria cells, but not so long that it removes all of the crystal violet from the thick peptidoglycan layer of the gram-positive bacteria cells. Exposure to the decolorizing alcohol for either too little time or too much time, will give you false results! Gram-negative bacteria have a thin peptidoglycan layer in their cell walls and should loose their purple-ish color from the Crystal Violet primary stain during this decolorization step. 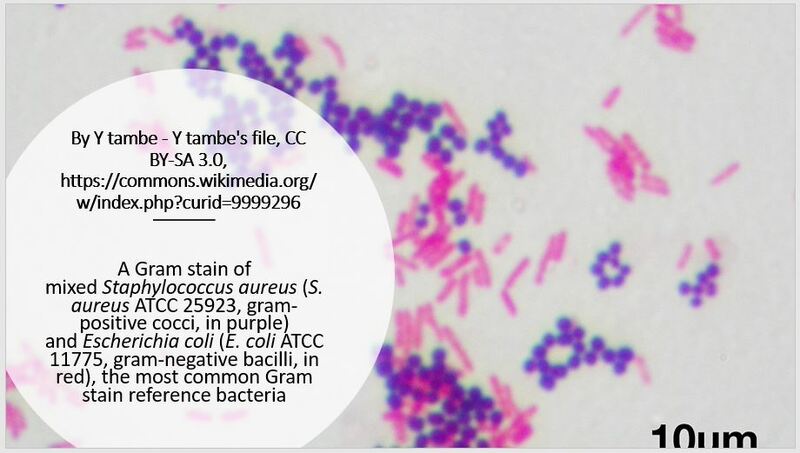 Gram-positive bacteria have a thick peptidoglycan layer in their cell walls and should be able to retain their purple color from the Crystal Violet primary stain following decolorization, which will during this decolorization step. What is the most important step of the gram procedure? The decolorizer step is the most important part of the gram stain procedure! Why is the decolorization step the most important step of the gram procedure? Because if it is done for too long, a gram positive cell can LOOK like a gram negative cell! If you do not decolorize long enough, then a gram negative cell can LOOK like gram positive cell. The idea is to keep the slide in the decolorizer long enough to remove the crystal violet stain from the thin peptidoglycan layer of the gram-negative bacteria cells, but not so long that it removes all of the crystal violet from the thick peptidoglycan layer of the gram-positive bacteria cells. Bacteria that do not have a cell wall would be considered "atypical" and will not stain at all with either Crystal Violet or Safranin! Atypical bacteria DO NOT STAIN at all with the gram stain procedure.